Publisher: GDW Games, QuikLink Interactive Inc.
What begins as a simple but lucrative express cargo charter quickly turns into a mystery. A plague of bad luck and misfortune seems to hit the adventurers at every port of call as they carry their cargo across two subsectors to its destination in the Grand Duchy of Stoner. Who is hounding the characters and why? And what will they do if the adventures refuse to cooperate? All aboard for the Stoner Express! 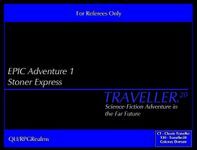 Stoner Express is a Traveller adventure set in the Domain of Gateway. It is designed specifically for use with both Classic Traveller and the Traveller20 rulesets. In addition to a complete adventure, this booklet also contains details on the Thorstone and Kraxin subsectors within the Glimmerdrift Reaches sector, a complete set of deckplans and statistics on the Type-S Scout/Courier starship, as well as statistics for a 300-ton Private Yacht, a 400-ton Patrol Cruiser, and a 400-ton Commerce Raider.